1. Set the oven to 220C. Peel the onion and chop finely. Peel the garlic and crush it or chop it finely. Heat the oil in a frying pan. 2. Cook the onion with garlic over a low heat until soft, then add the tinned tomatoes and tomato puree and stir well. 3. Let the pasta sauce simmer over a low heat for about 10 minutes. Then season it with salt, pepper and a pinch of sugar. 4. Boil some salted water in a saucepan. Add the pasta, cook it for about 12 minutes until just soft, then drain it in a colander. 5. Meanwhile, turn on the grill. Prick the sausages with a fork, then grill them on all sides for about 10-12 minutes until brown. 6. Remove the sausages from the grill, leave them until they are cool enough to handle, then cut them into chunky slices. 7. Grate the cheese for the topping. Grate the bread into breadcrumbs, or else make the breadcrumbs in a food processor. 8. 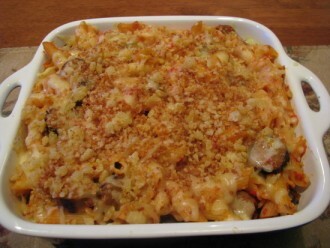 Stir the cooked pasta and sliced sausages into the tomato sauce, then spoon the mixture into a baking dish. 9. 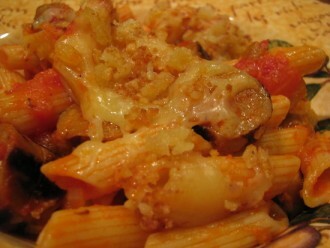 Sprinkle the breadcrumbs and grated cheese over the pasta. Bake for about 20-25 minutes until the topping is crisp.